Keep your dog looking and smelling their best with this tropical-scented shampoo that cleans and conditions in one easy step. The nourishing protein infused formula helps maintain a healthy coat free of mats and tangles while Vitamin E and Aloe go deep to moisturize your dog's skin. 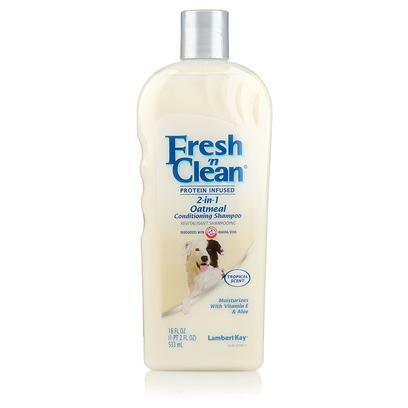 The clean, tropical scent is enhanced by Arm & Hammer deodorizers for long-lasting freshness. This naturally derived shampoo is suitable for all hair types, and the gentle formula makes it a smart choice for dogs with sensitive skin. Naturally derived gentle cleansing agents and conditioners. Wheat Protein, Aloe Vera, Vitamin E, Fragrance.